Bahrain says a newly-discovered oil field contains up to 80bn barrels of tight (or shale) oil, dwarfing the Gulf island kingdom's current reserves. 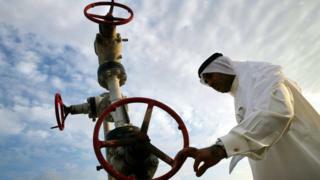 Officials expect extraction from the oil field to begin within five years, according to Bahrain's national news agency. By comparison, neighbouring Saudi Arabia, the world's top oil exporter, has 266bn barrels of proven reserves. Qatar, the top exporter of liquefied natural gas, has 24tn cubic metres of gas. In recent years, the Bahraini government had responded to its relatively small reserves and falling oil prices by seeking to diversify the economy into other sectors, such as financial services and tourism. Sheikh Mohammed told a news conference in Manama on Wednesday that the National Oil and Gas Authority aimed to attract foreign oil and gas firms to develop the Khaleej Al Bahrain field, which covers 2,000sq km. An agreement had already been reached with Halliburton to drill two further appraisal wells this year to "further evaluate reservoir potential, optimise completions, and initiate long-term production", he said.